It is with the utmost gratitude for your ongoing support, engagement, and partnership that I inform you this will be my last post with Educate Now!. In August of 2008, when Educate Now! was born, the education landscape in this city was complicated, to say the least. We were still putting the post-Katrina pieces back together. Charter schools were new but showing success, and our schools were governed by two different entities – the RSD and OPSB – that were largely failing to communicate with one another or with the public. For parents, educators, and activists alike, there was no central place to turn for data, information, or a singular, comprehensive view of what was going on citywide. Educate Now! has worked to fill that void. It is astounding to think of how far this city’s education system has come over these past nine years – and the generation of young lives changed as a result. I’m incredibly proud and grateful to have played a part in efforts to improve our students’ academic performance, graduation rates, and post-secondary readiness, and I am touched and inspired by the people working everyday on the frontline to improve the lives of our city’s youth. With each passing year, we are seeing more graduates leave high school better prepared to go forth into the world, and that is an achievement New Orleans can own with pride. Work will begin to create a new high school Career and Technical Center that will provide advanced training for interested students in fields like health sciences, IT, and skilled crafts or trades. The center has secured initial grant funding and is working with the Orleans Parish School Board (OPSB) to develop a sustainable funding plan. OPSB and the Orleans Parish Sheriff’s Office are launching new education program for young inmates at the Orleans Justice Center, with a new high school diploma track and additional classrooms to serve more students. The Times-Picayune looks at the new school line up for 2017-18, including which schools are opening this fall and which have closed. There are now 86 public schools in New Orleans – 41 overseen by OPSB, 38 overseen by RSD, and 7 statewide charters overseen by BESE. The state has released ACT and End of Course test scores for 2016-17. New Orleans schools (OPSB + RSD) held steady on the ACT, but the results for End of Course Tests were disappointing. The average ACT Composite Score was 18.9, the same as in 2015-16. The state’s Composite Score increased slightly from 19.5 to 19.6. The percentage of students scoring Excellent or Good on End of Course tests (EOCs) went down from 58% in 2015-16 to 52% in 2016-17. The state fell from 62% to 61%. The percentage of students scoring 18 or above on the ACT went up slightly to 54%, a 1 point increase from last year and a 5 point increase since 2013. The state also increased 1 percentage point over last year, from 62% to 63%, and 3 points since 2013. The state has released the results of the 2016-17 LEAP tests for grades 3-8. While a number of New Orleans schools showed improvement, fewer students overall met the new more rigorous Mastery standard, and the city fell in state rankings. New Orleans student performance in English decreased from 35% to 34% Mastery in English (-1) and from 27% to 25% Mastery in math (-2). 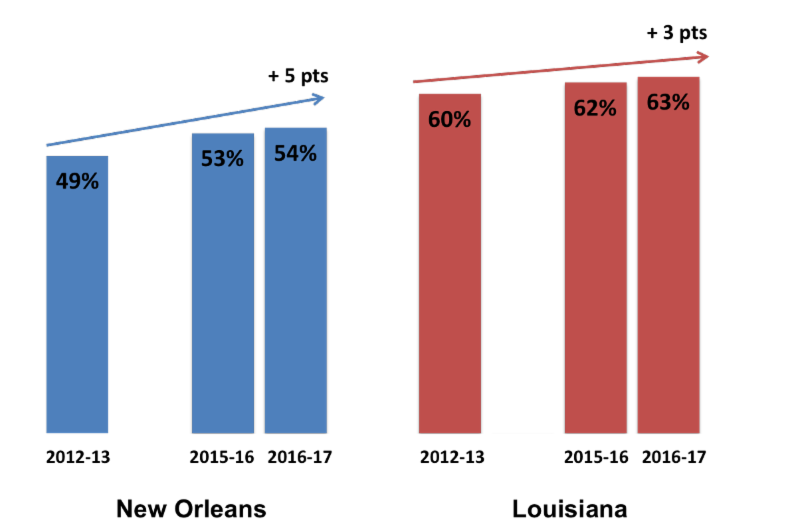 Statewide, the percent of students scoring Mastery in English improved from 41% to 42% (+1) and dropped in math, from 34% to 32% (-2). New Orleans outperformed the state average for African-American students and English Language Learners. New Orleans’ district rank fell from 47 to 50. The Carnegie Corporation profiled EdNavigator, a local nonprofit that works with companies to identify and support working parents who need help navigating the school system and advocating for their children. New Orleans’ own unCommon Construction won a national Teach For America 2017 Social Innovation Award. The nonprofit, which helps students earn credits and scholarships while building houses, will receive $50,000 from TFA to continue developing and expanding their reach. Researchers estimate that New Orleans children suffer from post-traumatic stress disorder at rates three times the national average. NPR highlighted Crocker College Prep, one of five charter schools in a collective working to become more trauma-informed, and the Christian Science Monitor visited the New Orleans Therapeutic Day Program, a school that gives children with severe trauma and emotional disturbance a safe place to learn. The Orleans Parish School Board and Recovery School District have released the latest 4-year cohort graduation rates. The citywide 4-year graduation rate was 72.1% for the class of 2016,1 a drop of 3.3 percentage points from 2015. Twenty percent of the students who did not graduate in four years remained in school and were enrolled for a fifth year in the fall of 2016. Statewide, the graduation rate fell from 77.5% to 77%. While the graduation rate of 72.1% is a huge improvement from the 54% graduation rate in 2005, these results are still disappointing. We are not graduating 1 in 4 students, even including students who take longer than 4 years to graduate, and the gap to the state average is getting larger, not smaller. Begin using data to identify drop outs in real time. By October, we can identify students who should be enrolled in school but are not. This information needs to be generated by the central office, as any individual school does not know if a student has dropped out or decided to attend another school. Once we know in a timely fashion which students dropped out, the district can partner with schools and other agencies to find these students and get them re-enrolled. Diversify our high schools. We need more alternative high schools to better address struggling students’ needs. We also need more high schools that offer meaningful career-technical education for interested students. Work to expand access to mental and behavioral health care for students before and during high school. Schools cannot do it alone. Improve our K-8 performance, as discussed below. 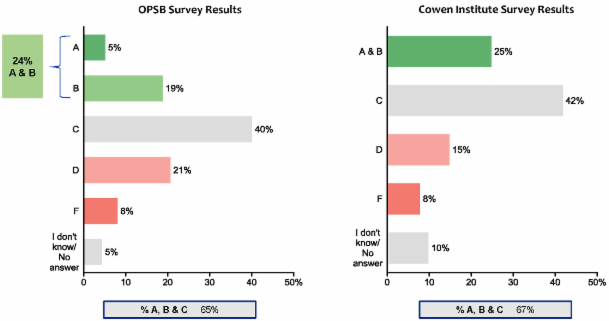 The Orleans Parish School Board (OPSB) has released the results of its citywide survey, and the Cowen Institute has released its report on their annual public perceptions poll. The results were very consistent between the two. This chart from OBSB’s report shows roughly one quarter of respondents in both surveys would give the public school system an A or B grade, and around 65 percent of respondents in both surveys would give the public school system an A, B, or C.
The Fordham Institute looks at education in President Trump’s first 100 days to see what has changed and what might change in public education. Some of the early changes enacted by the Trump administration include: eliminating school accountability regulations in the federal Every Student Succeeds Act, relaxing school lunch standards, rolling back protections for people who default on student loans, and reversing bathroom access guidelines for public schools. The Trump administration continues to promote school choice, including charter schools and vouchers. Voucher opponents will use a recent study conducted by the U.S. Department of Education of the Washington, DC, voucher program as ammunition to oppose vouchers. This study found students lost ground in their first year in private schools (compared to non-voucher students), as have recent studies in Louisiana, Ohio, and Indiana. Charter schools fared much better in the U.S. News & World Report’s annual high school rankings, with 6 of the top ten and 34 of the top hundred schools being charters. The New Orleans public school system is not going all-charter – at least not this year. Eleanor McMain will be chartered by InspireNOLA, but Ben Franklin Elementary, Mary Bethune, McDonogh 35, and Mahlia Jackson will continue to be run by the district through the 2017-18 school year. Last week, Exceed charter group withdrew its charter application after outside consultants said its application fell short. OPSB approved InspireNOLA’s application to charter Eleanor McMain. The Superintendent recommended and an OPSB committee approved closing Mahalia Jackson Elementary at the end of the 2017-18 school year, but the full board deferred action on the final decision at its meeting last week. After a contentious, six hour hearing, the state Board of Elementary and Secondary Education (BESE) approved Supt. John White’s plan for overhauling Louisiana schools – the first step in complying with the federal Every Student Succeeds Act (ESSA). BESE also approved submitting the plan to federal officials for review in April and not delaying until September as the governor wanted. Critics of the plan called for a five month delay, saying there should be more input from stakeholders, but White said his agency has held 136 meetings on ESSA and there will still be months to get input and debate changes to the plan before it would be implemented in the 2017-18 school year. Patrick Dobard is stepping down as superintendent of the Recovery School District. Dobard, a New Orleans native, will continue his work for public school students as CEO of New Schools for New Orleans. During his six years as head of the RSD, schools not only improved academically but also developed essential structures such as the OneApp enrollment system, unified expulsion procedures, and the systemic reduction in out-of-school suspensions.